The long autumn has been a blessing with respect to boat building conditions and I have been able to put in a couple of ten hour days. 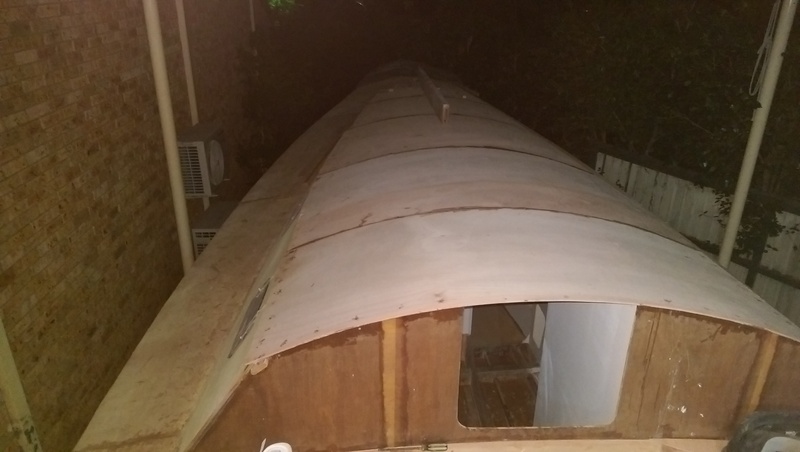 Monday was spent installing most of the double layers of plywood under the cabin roof. These are designed to take the load of the winches and cleats and deck organisers. I wanted to glue these into place before finishing the final 6 mm plywood layer on the cabin top for several reasons. 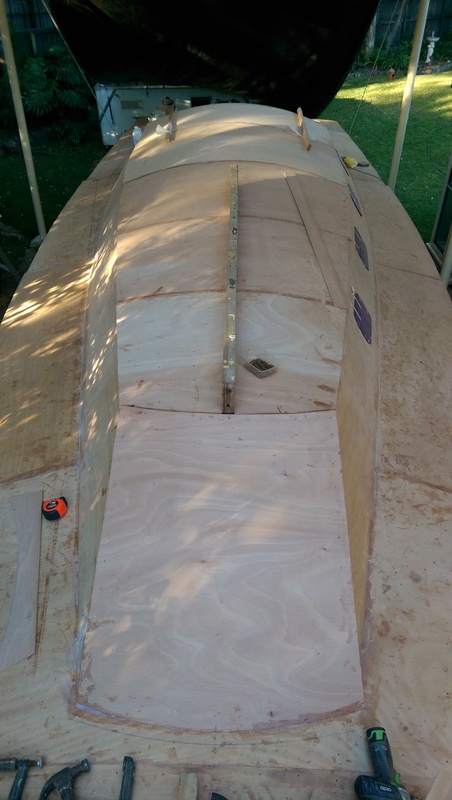 The additional two 6 mm layers of plywood fix the cabin top shape and give a solid backing to which the final layer can be screwed down and any of the screw holes from fixing the backing plates will be hidden under the final layer. I have increased the area of cabin top that has the two 6 mm plywood doublers because as well as winches and cleats I need backing for the spray dodger arches and the spray dodger track. Also we will be putting a bridle for the mainsheet controls across the cabin top and that needs a pretty substantial anchoring point. The extra weight is insignificant and I get a smooth inside of the cabin top without any stringers or visible step changes in thickness. I am thinking of getting the Yamnar 30 hp engine delivered next week. Before putting it in the hull I have to complete an epoxy fibreglass pan inside the engine mount timbers and give it all a few coats of epoxy paint. Also on order are the hatches and portlights and the stainless steel chainplates so there will be plenty to do. The first 6 mm ply wood layer on the cabin front of our Didi 40 Cr. The Deep LVL beam is a straight edge holding the cabin top level while the glue cures.